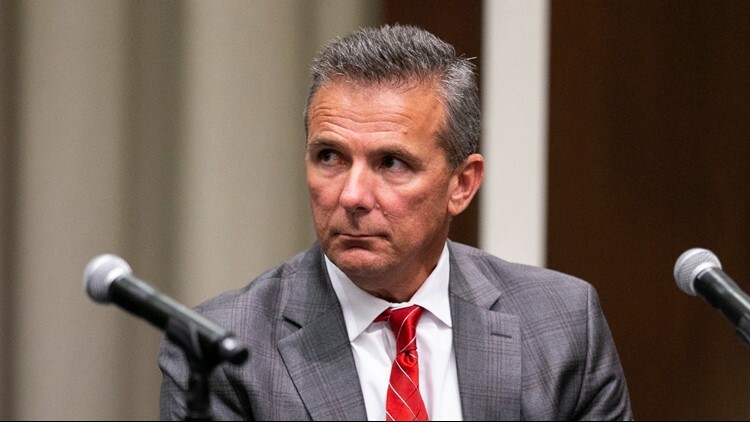 On Sunday, Urban Meyer sat down with ESPN's Tom Rinaldi to discuss how he handled accusations of domestic violence made against former assistant coach Zach Smith. Hours after Ohio State's 40-28 victory over TCU and just ahead of his full-time return to the Buckeyes' sideline, Urban Meyer sat down with ESPN's Tom Rinaldi to discuss his now-completed suspension and the past two months of turmoil that have surrounded his program. "I erred," Meyer said of his handling of domestic violence allegations made against former wide receivers coach Zach Smith. "I made a decision to do the best I can to help stabilize the situation." On Aug. 1, Ohio State placed Meyer on paid administrative leave following accusations he was aware of the claims made against Smith. Following a two-week investigation into his handling of the claims, Ohio State opted to suspend Meyer for the remainder of fall camp leading up to the first game of the season, as well as the first three games of the 2018 campaign. Ohio State also suspended athletic director Gene Smith from Sept. 1-17. Zach Smith was fired on July 23 after multiple accusations of domestic violence made by his ex-wife were made public. Although he admitted to having been aware of a 2009 incident in which charges against Smith were eventually dropped, Meyer initially denied having been aware of an event in 2015 for which Smith was never charged. After being placed on paid administrative leave, Meyer released a statement on Twitter admitting he was aware of the 2015 incident and that he reported it to the proper channels. "I recall being told and believed that this was not domestic violence. That she threw him out of the house and that there we no charges," Meyer told Rinaldi. "I was completely reliant on information from law enforcement." Among the criticisms of Meyer following the announcement of his suspension was his seeming unwillingness to apologize to Smith's ex-wife, Courtney Smith -- which he eventually did via a Twitter post. Asked about the core values of his program -- the first two of which are "honesty" and "treat women with respect" -- Meyer stated "I still hold those values so firm, so strong and I apologize for the perception that I've built." And as for the actions? "Also for the actions. It was a very tough time, a tough situation that Courtney was in, that Zach Smith was in. It was a very difficult divorce and we were led to believe a lot of things were going on... looking back now, I probably should have fired him." In Meyer's absence and with acting head coach Ryan Day at the helm, the fourth-ranked Buckeyes compiled a 3-0 record, with their most recent victory coming over the No. 15 Horned Frogs. Meyer will return to Ohio State's sideline on Saturday when it hosts Tulane at 3:30 p.m. ET.